ww2dbaseDonald Vivian Bennett was born in Lakeside, Ohio, United States to English immigrants Louis Bennett and Mary Grills Jacka. His family moved to Genoa, Ohio, and then to Oak Harbor, Ohio. He attended Michigan State University on a football scholarship, but the academics of Michigan State did not interest him. He applied for the United States Military Academy at West Point in 1934, but failed to secure an admission. In the summer of 1934, he worked for New York Central Railroad, working on the tracks. After his sophomore year at Michigan State University, he returned home to Ohio in Jul 1935. Learning from his father that West Point had just expanded the class size, he attempted it again. With the nomination from his local Congressman, he was admitted this time. Unfortunately, while he performed well in other subjects, he failed math, and was thrown out. With his father's connections, he traveled to Washington, DC, United States to study under Mr. Sullivan, a former professor at West Point. After months of cramming, he returned in 1936 and graduated in 1940. He was married to Betty Deacon on 24 Jun 1940 shortly after graduation. ww2dbaseOriginally thought destined for the Philippine Islands, Bennett found himself being sent to the Mojave Desert in southwest United States for a two-month long training in desert warfare. At Fort A. P. Hill in Virginia, United States, his unit was assigned the new M-7 Priest 105mm mobile artillery guns, a weapon so new that there were no printed manuals yet. Aboard converted ocean liner Santa Rosa, he was shipped to North Africa, landing on the invasion beaches only a handful of days after the initial landings. In Casablanca, he was placed in charge of a whore house maintained by the United States Army in order to keep troops content, then was assigned to be a part of the security team for Franklin Roosevelt and Winston Churchill during the Casablanca Conference. During this time, he worked closely with French Goum troops, who he came to respect; "they were truly frightful and proficient killers", he recalled. During the Allied invasion of Algeria, he commanded M-7 guns in support of George Patton's advance. On 9 May 1943, his unit reached Tunis, Tunisia. ww2dbaseOn 7 Jul 1943, Bennett was sent to Bizerte, Tunisia to board a LST transport ship for the invasion of Sicily. He landed at Licata uneventfully. His battalion was ordered to race north to the northern coast, which it did, and en route the battalion took over 3,000 prisoners. Unless you have seen it with your own eyes, you can have no real conception of what a battalion of M-7s could do to the landscape in a matter of minutes. Fifteen to twenty 105 rounds loaded with high explosives could devastate an acre or more of ground in one salvo, tearing apart trees, collapsing small buildings, kicking plumes of dust and smoke to the heavens. ww2dbaseAfter France, Bennett fought in the Low Countries, advancing against the German defenses at the Albert Canal near Fort Eben Emael and defending against the Ardennes Offensive. In the latter battle, he used shells equipped with proximity fuses; these shells, with their vacuum-tube radar mounted at the noses, exploded in the tree branches above the targeted areas about 30 yards above the ground. The results were deadly. Sprays of shrapnel rained down across a quarter acre of ground, killing nearly everything underneath. He recalled that the Germans were "terrified" of the carnage, and could not quite figure out why American artillery barrages suddenly became so effective. ww2dbaseOn 2 Mar 1945, Bennett crossed the Roer River, and shortly after he was sent to London, England, Britain for a short leave. At Westminster Abbey for a Sunday religious service, he observed "uniforms of those gathered there were from around the world, a dazzling display of the dying vestiges of the British Empire, combined with those of us from the New World and the grim survivors of occupied Europe." He also noted that several stained-glass windows were broken, presumably damaged during the Battle of Britain or during German rocket attacks. ww2dbaseIn May 1945, Bennett and his unit reached the Elbe River, and by 7 May he was in Czechoslovakia, several hundred miles behind George Patton's Third Army spearhead. He continued to observe sporadic fighting, often from those of various Hitler Youth units. On the next day, his 30th birthday, he received word that fighting was to be over that night at midnight. "There was no glory, only relief, only a wish to lay down our tools of death and to rest", he said. "I was never so old as I was on that night. All the years since then have been a gift." ww2dbaseAs a member of the Allied occupation force, Bennett witnessed a "betrayal of what we were supposedly fighting for": Allied troops were told to turn all westward-traveling refugees back, leaving them in Russian occupied zone, with those soldiers whom these refugees were fleeing from. He witnessed first-hand the tensions between the Western Allies and the Russians that quickly built up after the end of the European War. He was notified that he would be sent to participate in the Pacific War, but Japan surrendered before he was shipped out. ww2dbaseAfter the war, Bennett returned to the United States in Nov 1945 via Boston, Massachusetts. Remaining in the US Army, he gained rank consistently in the post-war years. 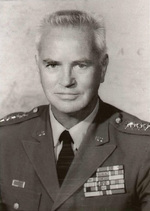 He served as the superintendent of the United States Military Academy from 1966 to 1969. Between 1969 and 1972, he was the Director of the Defense Intelligence Agency. In 1972, he was named the commanding general of the US Army Pacific Command. He retired from active service in 1974 and passed away in Asheville, North Carolina, United States in Nov 2005. He now rests at West Point, New York, United States in the academy's cemetery. ww2dbaseBennett's memoir was published in 2003 under the title Honor Untarnished. 9 May 1915 Donald Bennett was born. 28 Nov 2005 Donald Bennett passed away. I am reading his memoir Honor Unvarnished and am grateful for this man, especially what he did on D-Day, but also North Africa and Sicily and England. God Bless you and rest in peace. this is my great uncle, he was a four star general and the superintendent of west point during vietnam. He left when JFK was assasinated. He proceeded to comand NATO and when I wrote him a letter questioning the nature of human aggresion in 2001 he gave me great and wise counsel. I wanted to share this with you because, it might shock some folks to hear that I, Tim, was very close to enlisting in 2005 to support the US military. 11/11/08 Today, Veterans Day I have just completed Honor Untarnished and am truly moved by General Bennet's memoir. His respect and gratitude for his troops was truly humbling. He showed such humility and pride in his country and men, yet left it perfectly clear what the horrors of war does. I am so thankful for his insight and service to our country. While dating his aide de camp CPT michael nawrosky I met 6eneral Bennett at west point where he served as commandant. He and his wife were gracious and wonderful hosts. The General had great insight into the what made America great. He was a true patriot. It should be noted above that before receiving his fourth star and taking command of the Defense Intelligence Agency, General Bennett was Commander of VII Corps. VII Corps was headquartered to Kelley Barracks, Stuttgart, Germany. He was a leader of leaders. 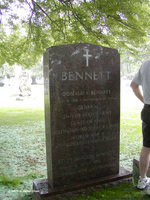 He and his son, David, were invited to West Point many years later when General Bennett was Commandant!